When someone mentions a brand certain things pop into mind. The logo, colour scheme & the products are all things that stand out. If a company has these signifiers they will resonate in a customer’s mind. There are several reasons as to why branding is important. What do you associate with a brand? When people think of brands they think of the things that makes this company stand out to their competitors. 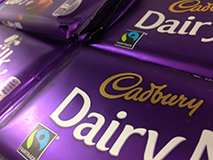 For example, with Cadbury’s you are likely to think of their logo, the colour purple and some of their products. These are all part of the branding. It is important to have these signifiers for people to associate with your brand. If someone wants a certain product or service in that specific market you want your branding to be the first thing stands out in their head. Customers are more likely to re visit a company if their branding is professional and easily recognisable. Emotional reactions to products or services are natural and bring a positive reaction leading to a purchase. This can also result in an interest in other products that they would not have previously considered just because they like the branding. It can be very useful to have easily recognisable branding when launching a different product to usual. Maintaining a consistent colour scheme throughout websites, social media pages and products is a key part in enhancing your branding. Everyone knows what colour the label of Coca-Cola is as it is synonymous with that brand. If your logo is blue on one page but randomly changes to green on other pages with no reason behind such a change it will confuse your customers who may not remember your brand as clearly due to constant changing colours. Some companies may offer different products with different colour schemes to distinguish the products. If a brand makes a positive impression the chances are your customers will tell friends and family about their experience. Word of mouth is a valuable resource for advertising and having a good brand goes a long way. If customers aren’t able to remember the company name off the top of their head they may remember the other parts of the brand such as the logo or colour scheme in order to point other potential customers to the company. If you have any questions or would like some guidance on branding contact us and we will be happy to help.